Cover the greatest distance per unit of fuel consumed. Stay in the air for the longest time per unit of fuel consumed. 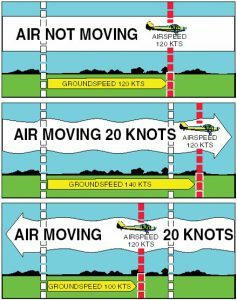 To make effective use of an aircraft, you must understand the concepts of range and endurance and be able to use available charts to determine range and endurance in known circumstances. At straight-and-level flight what can I do to increase airspeed without changing altitude ? What happens with visual reference if I increase the pitch attitude ? Explain: Attitude + Power = Performance. Range is “the distance an airplane can travel with a given amount of fuel”. To cover the greatest distance for the fuel carried. To use the least fuel for the distance which is required to travel. Drag is the price paid to obtain lift. The lift to drag ratio (L/D) is the amount of lift generated by a wing (or airfoil) compared to its drag. 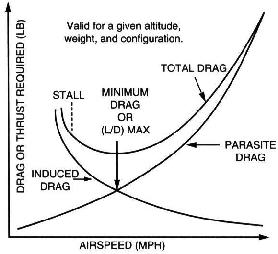 In unaccelerated flight with the lift and drag data steady, the proportions of the coefficient of Lift (CL) and coefficient of drag (CD) can be calculated for specific Angle Of Attack (AOA). The maximum range condition is obtained at maximum lift/drag ratio (L/DMAX). 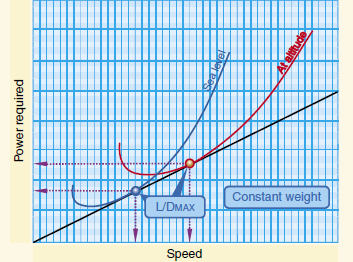 Increased aircraft weight increases the drag due to increase induced drag (greater lift required). The greater thrust, requires to balance the drag, increases the fuel flow and reduces the specific range (number of miles flown per gallons of fuel). Approximately 10% increase in mass will require 10% increase in thrust and fuel flow and 5% decrease in range. Increasing altitude (decreasing air density) increases the range up to an optimum altitude, and then decreases again. Air density decreases the amount of power but as air density decreases, the resistance of the air decreases also, therefore that means less drag. The speed which gives the maximum range for a given aircraft weight and altitude is called best range speed. Flying at higher speeds than the best range speed increases the drag and the fuel flow, and therefore reduces the range. Lower speeds than the best range speed reduce the drag and the fuel flow, but they also reduce the distance traveled per time which is more dominant, and therefore reduce the range. 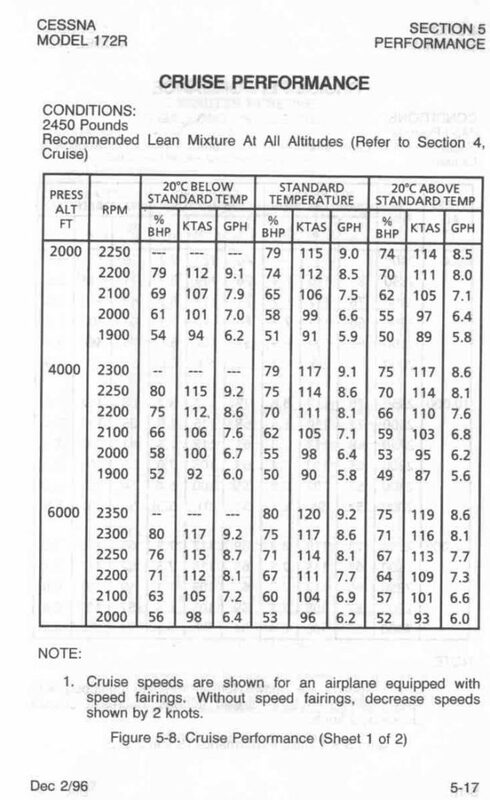 Best range speed is considered in reference to the air. If the air mass is moving (wind), the speed in reference to the ground is different. The best range will be reduced in a headwind condition and the best range speed would be higher. The opposite occurs in a tailwind condition, the best range will be increased and the best range speed would be lower. At higher altitudes the fuel/air mixture must be leaned to decrease the fuel flow in order to compensate for the decreased air density. If you descend from high altitudes to lower altitudes without enriching the mixture, the mixture will become leaner because the air is denser at low altitudes. Lean mixture economizes fuel and therefore, improves the performance range, but be careful do not lean too much the mixture that will increase operating temperatures in the combustion chamber. Rotate mixture control counter clockwise until engine RPM peaks and then lean further until it dips 25-50 RPM. 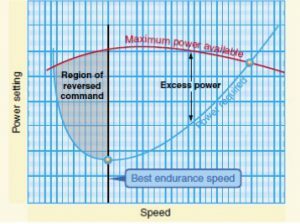 Endurance is “is the maximum length of time an aircraft may remain airborne for a given power setting depending on the amount of fuel carried.”. For example to wait the clearance of an ATC before entering in the airspace. 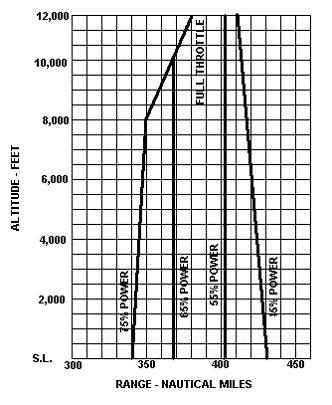 The speed achieved with maximum cruise thrust will vary with aircraft mass, altitude and temperature. Increased aircraft mass increases the drag, we need more lift to maintain straight-and-level flight and more thrust (power) to maintain speed, more power act badly on fuel consumption. For reciprocating engine, maximum endurance is achieved a sea level. Turbulence changes the angle of pitch at which the relative airflow meets the wing. At higher angle of attack, more power is required to overcome the increased drag. Flaps are not generally used when the aircraft is being flown for endurance. While increasing the lift, flaps will also increase the drag resulting in more power being required to maintain level flight thus defeating the purpose. Once the minimum power setting for level flight has been found (see next page), maximum endurance may only be achieved with the mixture leaned properly. You may notice that as the mixture is leaned, there will be an increase rpm. If this should be the case, remember to readjust rpm. More weight means more power required. Minimum speed increases with a weight increase so endurance suffers. So the message is simple: loose the weight or loose the endurance. For a given amount of available fuel, if we operate the aircraft at a particular power setting we can stay in the air for “X” amount of time. The higher the power setting, the shorter the period of time we can stay aloft. The wind has no effect on endurance flight the goal is staying in flight as much as possible not to flight a distance. 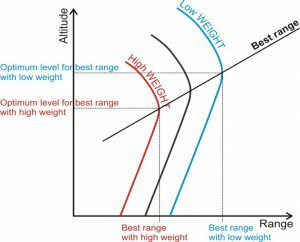 What effect will increase weight have on endurance flight ? What effect does the wind have on endurance flight ? What factors can effect best range ? At what altitude best endurance is achieved ?